The Baccalaureate Ceremony, for the class of 2019, will be held on Thursday, June 6 at 7:00 at St. Rocco in Avondale. It’s a lovely and traditional part of all graduations. In addition to attending, seniors are always part of the service as speakers, readers, ushers, musicians, or vocalists. If you have an interest in participating or questions about it, see Ms. Lamoreux in room 104. 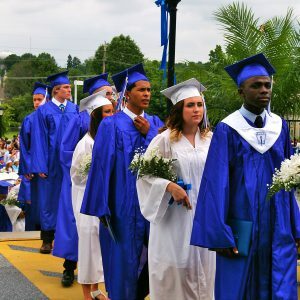 In addition to the traditional commencement ceremony with its cap and gown and congratulatory handshakes, vale dictorian speech (or speeches) and recognition of outstanding achievements, high schools also have baccalaureate ceremonies. Formally defined as a service to honor the graduating class, the baccalaureate is a quieter, more reflective event that focuses on students’ personal growth and achievement. The baccalaureate can often be a more substantive and meaningful experience for parents and students alike. Demon Robotics is competing at the District championships today in Lehigh. Good luck to everyone! Congratulations to the Softball team for their 7-0 victory over Sun Valley. The Boys Lacrosse team defeats Unionville 9-8 in overtime. Great win! 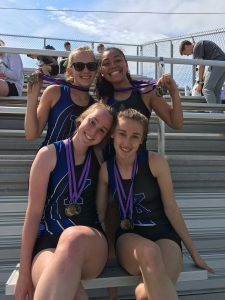 Scarlet Morgan, Ashley Wiley, Vanessa Woodson and Rachel Hyzny take first in the 4×1000 and second in the 4×600 at the Phoenixville Distance Project. The Kennett High School Blue and White Chapter of the National Honor Society welcomed the 2019-20 inductees at a ceremony and reception on March 28, 2019. Chapter adviser Dr. Alicia Tamargo opened the program. Four National Honor Society members from the Class of 2019 delivered speeches highlighting the Cardinal Objectives, the qualities expected of members: Mirella Petrillo addressed character; Davis Piercy spoke about scholarship; Colin Petersen focused on leadership; and Kassandra Ayllon highlighted the idea of service. Senior speeches were delivered by Timothy Freligh and Avery Chapman. Next, Mr. Jeffery Thomas, Assistant Principal, called the role of the existing members of the Chapter. These students were inducted into the Society last year: Lilian Alba Rodriguez, Emily Augustine, Camille Avedisian, Kassandra Ayllon, Lizette Bedolla-Zavala, Amanda Bell, Jonathan Bell, Claire Borman, Julia Bradley, JaynaBruno, Madison Canter, Mara Castleton, Avery Chapman, Ava Charlton, Heather Cooper, Alexandra Cresci, Maya Das, Zhuanel Du Toit, Kathryn Erisman, Christopher Ferrighetto, Victoria Freire*, Timothy Freligh, Emma Giancola, Holly Gouge, Molly Hohner, Mary Holguin, Alexandra Hughson, Rachel Hyzny*, Rhea Jiang*, Mitchell Kosara, Meredith Krieger, Kevin Lemus Moreno, Samuel Lesher, John MacMillan, Peter Magasiny, Brenna McGowan, Olivia McLaurin, Sydney Mentzer, Tamblyn Mitchell*, Jack Mullen, Zoe Nguyen, Caleb Pebly, Colin Petersen, Mirella Petrillo, Davis Piercy, Noah Rasero, Hildi Reiter, Kyle Robertson, Cole Robinson, Katherine Roche, Katelin Rumbold, Eric Salameda, Joseph Schlitz, ConnorSchmidt, Evan Shinn, Ananya Shivakumar, Samuel Starr*, Kristina Testa, Sydney Thureen, Tamryn Whyte, Elizabeth Wilkie, Emma Yue, and Brenna Zdebski. Dr. Jeremy Hritz, Principal, called the role of new inductees who were welcomed into the Chapter: Seniors Luis Aguilar-Gaspar, Julia Bulgarelli, Refugio J. Lara, Lauren Moss, Joshua Ploener, Estefani Sanchez Fonseca, and Emma Whittaker; Juniors Jacob Adelman, Olutomilola Adetayo, Ainsley Albert, Savannah Applegate, Ryan Barish, Sophie Becker, Steven Blake Bolhouse, Trevor Bowdoin, Jordan Brown, Giovanna Caccamo, Shawn Carroll, Gabriella Caruso, Mary Charnichko, John Colamarino, Simon Comanda, Ellie Conlin-Day, Ian Dargitz, Jenna Davidson, Veronica Duran Paramo, Arya Faghri, Elisabeth Fenza, Caroline Fiss, Cali Fitzgibbon, Lucas Forte, Madeline Fowler, Mackenzie Fulton, Ronan Gorman, James Hanby, Kyle Highfield, Jessica Holck, Katherine Holguin, Lauren Jackson, Nathan Judd, Emily Kane, Emily Kaplan, Brennen Kohl, Rachael Kreicker, Megan Kuon, Rebecca Larimer, Katherine Lihou, Laisha Luevano Jimenez, Gina Lusvardi, Sofia Lusvardi, Ellen McVey, Maggie Meyreles, Gemma Morrison, Kara Murphy, Stephanie Oleykowski, Cameron Olivier, David Opong, Thomas Poncet, Tejis Ranganath, Abisai Rodriguez-Aguilar, Kennedy Ross, Jillian Rowan, Kira Rybarczyk, Jessica Sauer, Damaris Silva-Lopez, Alexa Simonson, Emily Taylor, Mirna Torres-Ayala, Mary Tuley, Ashley Willey, and Mantra Yang. Following the induction ceremony and roll call, Assistant Principal Tomorrow Jenkins administered the pledge of honor, and Dr. Tamargo announced the newly elected officers for 2019-20: President Gemma Morrison, Vice President Ian Dargitz, Secretary Emily Kaplan, Treasurer Ashley Willey, and Historian Giovanna Caccamo. Dr. Hritz then closed the ceremony and invited all to a reception in the cafeteria. Members of the Blue and White Chapter must demonstrate and maintain high standards of the four hallmarks of the National Honor Society: scholarship, leadership, character, and service. Throughout the year, National Honor Society members participate in service activities, including tutoring and fundraising. This year they have organized two blood drives for the American Red Cross, worked on crews for the Mushroom Festival, volunteered at Project Cure, hosted a “Senior Prom” at the Senior Center, and ushered patrons at this year’s musical Seussical. The group is also looking forward to activities in the community this spring, particularly volunteering at the Kennett Run. 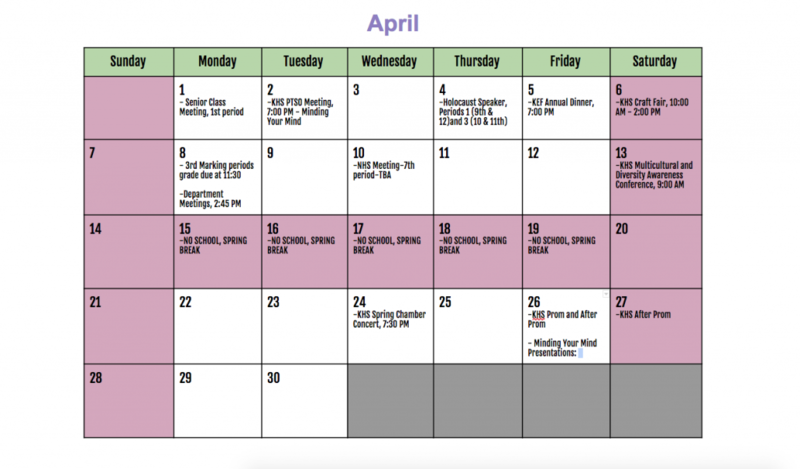 Members of the Blue and White Chapter became eligible by posting a 3.75 grade point average (GPA) by the second semester of their junior year. Additional qualities of character, leadership, and service were assessed by the faculty of Kennett High School and reviewed by members of the National Honor Society Faculty Council who are chosen by the principal from among the faculty and serve for a period of two years. This year’s Faculty Council included Mr. Jess Bewley, Mr. Vincent Civiletti, Mrs. Sara Donovan, Dr. Christopher Hancock, Ms. Adrienne Hartford, Mr. Kevin Lentz, Ms. Heather Morihara, Mr. Joseph O’Sullivan, Ms. Elizabeth Rzucidlo, Mrs. Chanel Ruffin, Ms. Jennifer Schmalzbach, Mr. Robert Socash, Mr. Robert Virgin, and Mr. Mark Williamson. 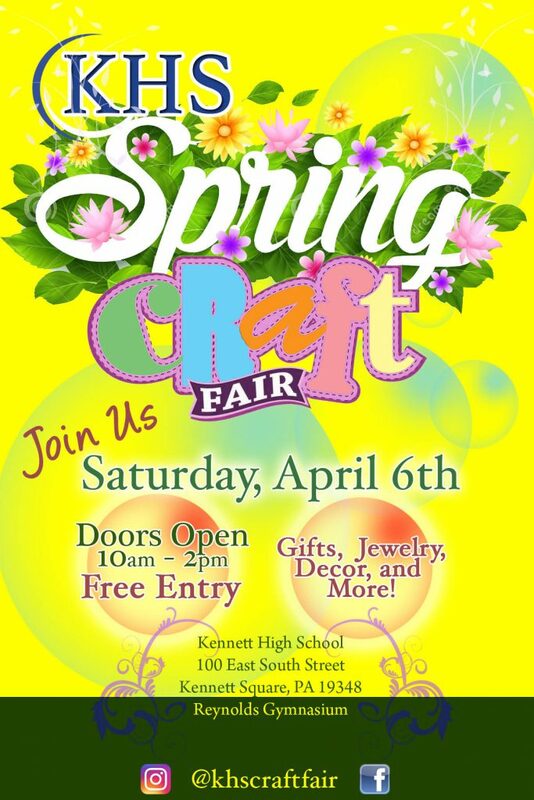 On Saturday, April 6, 2019, Kennett High School will host its first craft fair. The event is being organized by Kennett High School teachers Elizabeth Ely, Chanel Ruffin, and Brittany Schiavo, and all proceeds will benefit the fundraising efforts of the KHS Classes of 2021 and 2022. 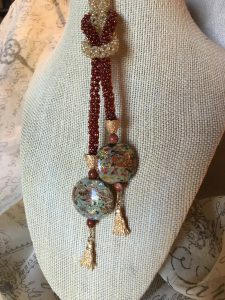 The event will feature nearly seventy different craft vendors with wares covering a wide range of offerings. 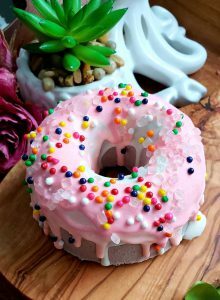 Products will include soaps and lotions, bird houses, stationery, wreaths, chocolates, artisanal breads, textile arts, dog treats, macramé, jewelry, woodworking, hair accessories, 31, Tastefully Simple, and many, many more. “We are truly grateful for the support of the classes of 2021 and 2022,” she added. The fair will be held from 10 a.m. to 2 p.m. in the main and auxiliary gymnasiums of the high school. Entrance to the fair will be through the main doors of Reynolds Gymnasium. Admission is free to the public. Concessions to include Chick-fil-a sandwiches and pizza. Cold beverages will be available for purchase as well. A dedicated and enthusiastic group of over three hundred Kennett High School students remained on their feet from 10 p.m. Friday, February 22, to 6 a.m. on Saturday morning for Mini-THON, an event to raise money for the Four Diamonds Fund to benefit pediatric cancer research and families whose children are battling the disease. Through a variety of events, raffles, generous corporate contributions, donations, and the Wizards basketball game, students have worked tirelessly in pursuit of this year’s goal. 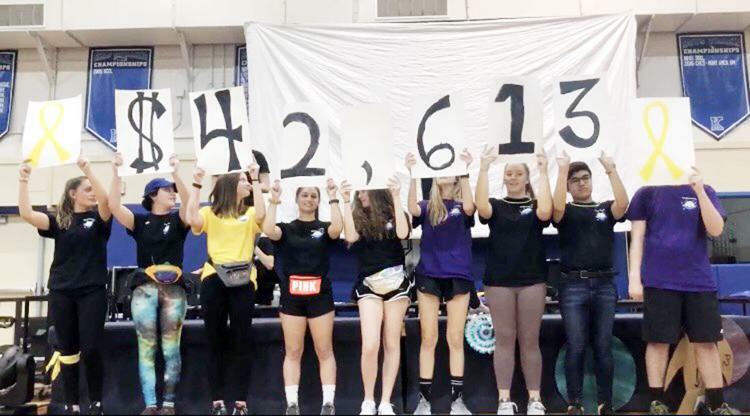 In the early hours of Saturday morning, student senior chairperson Jayna Bruno revealed the impressive fundraising total of $42,613 to incredibly tired but happy participants. And the donations continue to accrue. Despite the fact that this is Kennett’s fourth year sponsoring a Mini-THON, enthusiasm is not waning. If fact, more students participated this year than in previous years. 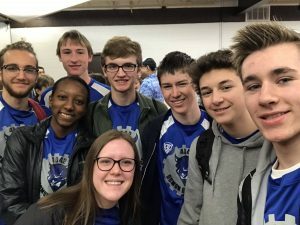 Modeled after Penn State’s Dance Marathon (THON), Kennett High School’s Mini-THON featured eight hours packed with fun activities, music, and food, all with an outer space theme. Faculty advisors for the event are Lisa Teixeira, KHS librarian and Humanitarian Club moderator, and Shawn Duffy, social studies teacher and Humanitarian Club assistant moderator. Twenty-four Mini-THON Executive Student Committee Members are led by senior event chair Jayna Bruno and junior chair Ashley Willey. And joining these student leaders for the event were Kennett alums Michael Bellino and Meredith Mitchell and several teacher chaperones. 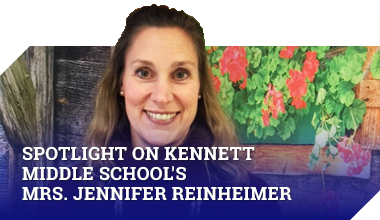 “I am so proud of the Kennett High School Mini-THON team, particularly my co-chair, Shawn Duffy, and this year’s student leaders Jayna Bruno and Ashley Willey. Our group seeks to not only raise money for Four Diamonds but to provide the community, in and out of school, with a framework for unity, inclusiveness, and fun,” said Ms. Teixeira. “And I am truly overwhelmed by the continued generous support from our community,” she added. If you would still like to make a donation, please visit the Kennett High School Mini-THON website at khsminithon.org or call the school at 610-444-6617 for more information. 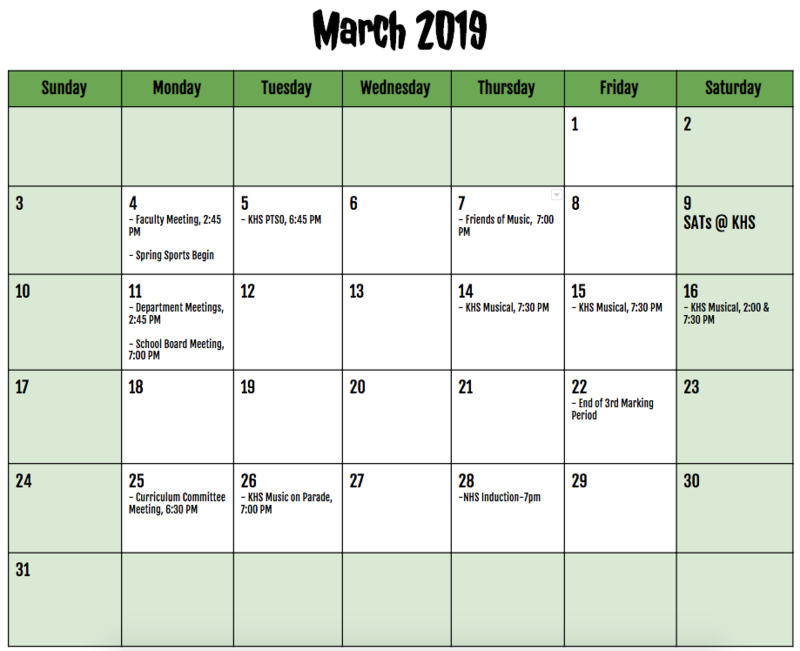 March…What You Need To Know! More than 300 Kennett High School students remained on their feet from 10 p.m. Friday, February 22, to 6 a.m. on Saturday morning for Mini-THON, an event to raise money for the Four Diamonds Fund to benefit pediatric cancer research and families whose children are battling the disease. Congratulations to Lisa Teixeira, Shawn Duffy, and our student leaders for another successful Mini-THON! Outstanding work! FREE prizes and food for teachers, students & families. Please mention you are there for Kennett before you place you order. 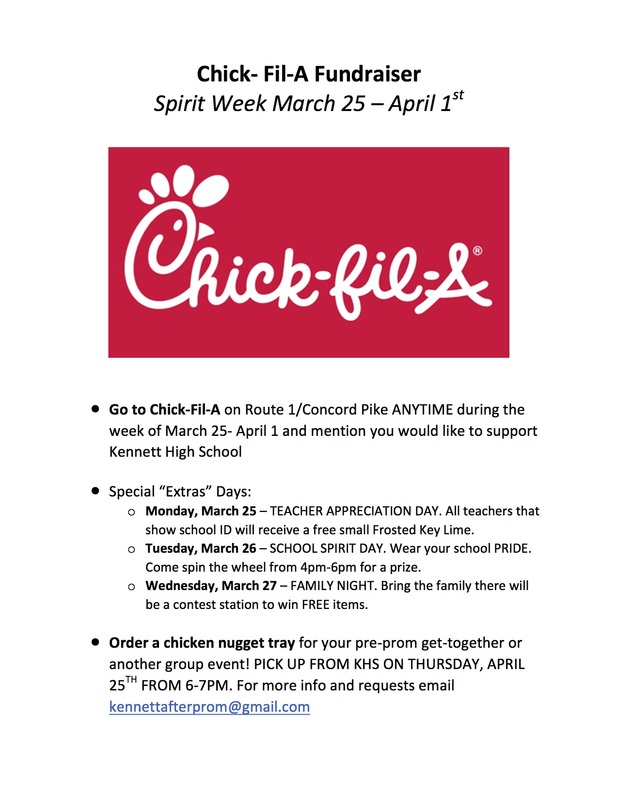 Also, Chick-Fil-A nugget trays available for pickup at KHS on April 25th. 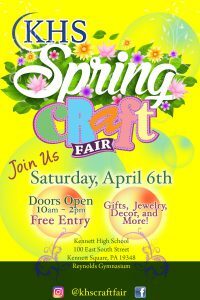 Be sure to mark you calendar for the first KHS Spring Craft Fair. 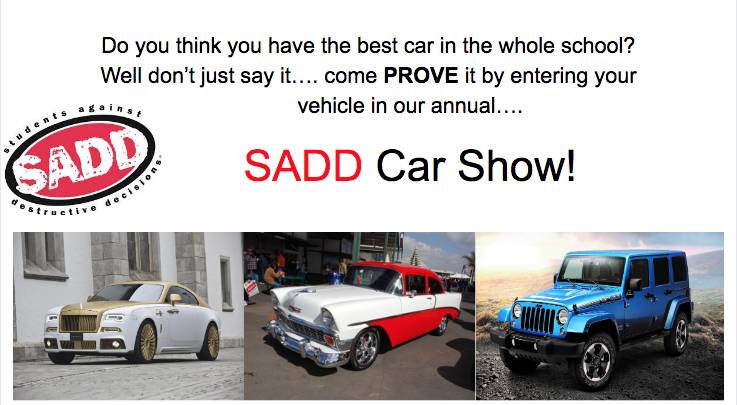 Over 90 Vendors scheduled to attend! Kennett High School will present its annual musical March 14 through 16. This year’s production of Seussical includes a cast of over fifty Kennett High School singers, actors, and dancers. Seussical is a fantastical, magical, musical extravaganza. The show, written by Tony award winners Lynn Ahrens and Stephen Flaherty, lovingly brings to life everyone’s favorite Dr. Seuss characters, including Horton the Elephant, the Cat in the Hat, Gertrude McFuzz, lazy Mayzie, and Jojo, a little boy with a big imagination. These colorful characters transport the audience from the Jungle of Nool to the Circus McGurkus to the invisible world of the Whos. The Cat in the Hat (Colin Petersen) tells the story of Horton (Ryan Myers), an elephant who discovers a speck of dust that contains the Whos, including Jojo (Justin McAndrew), a Who child sent off to military school for thinking too many “thinks.” Horton faces a double challenge: not only must he protect the Whos from a world of naysayers and dangers, but he must guard an abandoned egg left in his care by the irresponsible Mayzie La Bird (Lilian Alba). Although Horton faces ridicule, danger, kidnapping, and a trial, the intrepid Gertrude McFuzz (Rachel Hyzny) never loses faith in him. Ultimately, the powers of friendship, loyalty, family, and community are tested and emerge triumphant. Filling out the cast of characters are Mrs. Mayor (Anna Brunke), Mr. Mayor (Daniel Battalora), the General (Evan Shinn), the Bird Girls (Allie Hodges, Catt Seamon, Cecelia Barron, Emma Giancola, Hanna Pirestani, Leah Wardwell, Maya Ranganath, and Rebecca Larimer), and the Wickersham Brothers (David Diokno, Jack Ryan, Peter Magasiny, Robert Rauscher, Tejis Ranganath, and Tim Freligh). Dance captain is Tamblyn Mitchell. Music director Guenevere Calabrese Finley and stage director/choreographer Cindy Albertini have worked together to create an experience that is truly fun for the whole family. Rachel Brunke and Vicki Petersen serve as the show’s costume coordinators, and Michael Anastas will manage the sound and lighting crew. Becca Calabrese will supervise the stage crew. Show times are Thursday, Friday, and Saturday at 7:30 PM. There is also a Saturday matinee at 2:00 PM. Tickets may be reserved in advance (www.kcsd.org) or purchased at the door.